Tebipenem (brand name: Orapenem) is a broad-spectrum orally-administered antibiotic, from the carbapenem subgroup of β-lactam antibiotics. It was developed as a replacement drug to combat bacteria that had acquired antibiotic resistance to commonly used antibiotics. Tebipenem is formulated as the ester tebipenem pivoxil due to the better absorption and improved bioavailability of this form. It has performed well in clinical trials for ear infection and looks likely to be further developed in future. It is only marketed in Japan. Tebipenem is the first carbapenem whose prodrug form, the pivalyl ester, is orally available. Tebipenem pivoxil, an oral carbapenem prodrug, was launched in Japan in 2009 by Meiji Seika Pharma for the treatment of bacterial infection in children. The drug candidate was originally developed at Wyeth Pharmaceuticals (now Pfizer) and was subsequently licensed to Meiji Seika. Tebipenem pivoxil was approved by Pharmaceuticals and Medical Devices Agency of Japan (PMDA) on Apr 22, 2009. It was developed and marketed as Orapenem® by Meiji Seika in Japan. In 2017, the product was licensed to Spero Therapeutics by Meiji Seika Pharma for worldwide development and commercialization, except in Japan and certain Asian countries, where Meiji will retain rights. Tebipenem pivoxil is a broad-spectrum orally-administered antibiotic, from the carbapenem subgroup of β-lactam antibiotics. Carbapenems are a class of beta-lactam antibiotics, which act by inhibiting the synthesis of the peptidoglycan layer of bacterial cell walls. It is used to treat otorhinolaryngological infection, otitis media and bacterial pneumonia. Orapenem® is available as granules for oral use, containing 100 mg Tebipenem pivoxil/g granules. According to the weight of children, 4 mg/kg, and twice a day after dinner. developed by the American company Pfizer, for Bipei Nan ester fine granules developed by the Japanese company Meiji, in February 2009 was approved in Japan, and listed in April 2009. Alternatively Bipei Nan prodrug esters are for Bipei Nan, the lower the water after oral administration of the parent drug esterase for Bipei Nan, penicillin-binding protein binding to bacteria (the PBP), inhibition of bacterial cell wall synthesis, and is the only can oral carbapenem antibiotics. Alternatively esters Bipei Nan structural characteristics, is a C3-side chain is thiazolyl substituted azetidinyl group, while in the C2 position by matching volts carboxylic ester forming a prodrug, increased oral absorbability; its oral absorption is better than in most β_ lactam antibiotics already on the market now. Bipei Nan for a broad spectrum antibiotic; especially for the PRSP in recent years, mainly due to the infection caused by children (penicillin-resistant Streptococcus pneumoniae), MRSP (erythromycin-resistant Streptococcus pneumoniae) and Haemophilusinfluenzae (Haemophilus influenzae) showed a very strong antibacterial effect. Alternatively Bipei Nan as prodrugs compared to for Bipei Nan horses volts for Bipei Nan ester having a better absorption kinetics, has good stability. TakeshiIsoda like literature SynthesesandPharmacokineticStudiesof ProdrugEstersfortheDevelopmentofOralCarbapenem, L-084 (TheJournalof Antibiotics (2006) 59, 241 – 247; doi:. 10 · 1038 / ja 2006. 34) discloses a method for the synthesis of ester Bipei Nan : the Bipei Nan Alternatively, benzyltriethylammonium chloride, and chloromethyl pivalate was dissolved in N, N- dimethylformamide was added a solution of N, N- diisopropylethylamine, in the reaction was stirred for 4h at 45 ° C, the reaction was cooled to complete 5 ° C, was added ethyl acetate and water, the mixture was adjusted with aqueous citric acid I.OM PH = 4, the organic phase was discarded, the aqueous phase was adjusted with potassium bicarbonate to PH = 7. 6, the mixture extracted with ethyl acetate, the organic phase was washed with water and aqueous sodium chloride, dried over anhydrous magnesium sulfate, and concentrated under reduced pressure, the residue was subjected to silica gel column to give a yellow solid which was slurried with ethyl acetate to give colorless crystals. The column chromatography method requires not only consume a large amount of organic solvent together IJ, and a long time, so this method is not suitable for industrial production. In addition, the resulting large solid slurried with ethyl acetate, a solid dispersion is not easy, affect the uniformity of the product. 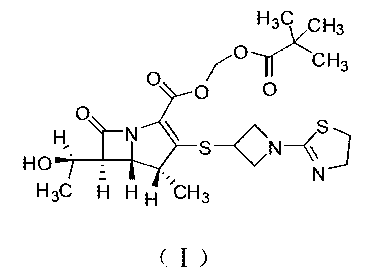 Patent US5534510, EP0632039, JP10-195076 discloses a method for synthesizing Bipei Nan ester is: dissolved after lyophilization for Bipei Nan aqueous sodium bicarbonate, lyophilized solid was dissolved in N, N- two dimethylformamide, adding a specific acid, methyl iodide, LH stirred at room temperature, ethyl acetate was added the reaction was completed, the organic phase was washed with saturated aqueous sodium bicarbonate, washed with brine, dried over anhydrous magnesium sulfate, the solvent was removed, the residue was subjected Alternatively Bipei Nan silica gel column to give the ester.The Mr. Fang Fati Bipei Nan for Bipei Nan into the sodium salt of pivalic acid with methyl iodide, prior to lyophilization to remove water required for the reaction, or affect the subsequent reaction with methyl iodide pivalate, lyophilized difficult when enlarged and the operation will take longer, the method further column chromatography operations shall therefore not suitable for industrial production. Chinese patent CN102633801A disclosed for the preparation of esters Bipei Nan, including the following steps of: for Bipei Nan I. 37g, N, N- 11 ml of dimethylformamide, potassium carbonate 0 · 5g, tetrabutylphosphonium bromide 0 · 03g, reaction at 0 · 5h -KTC, Stuttgart dropwise at this temperature, methyl iodide 〇.88g acid, ethyl acetate was added the reaction was completed Ilml insolubles were filtered off, the filtrate was washed with water 22ml, water Ilml phase was extracted once with ethyl acetate, the combined ethyl acetate, washed with water and ethyl acetate are added 11 ml of water, adjusted to 3.5 with aqueous citric acid, phases were separated, the aqueous phase washed with ethyl acetate Ilml with the aqueous phase is added acetic acid 22ml ethyl ester, was adjusted to 7.5 with aqueous sodium bicarbonate, phase separation, washed with water and 22ml ethyl acetate, the ethyl acetate phase over anhydrous sodium sulfate was added 0. 5g, dried decolorizing charcoal, the filtrate was concentrated to a volume, stirring crystallization, cooling to 〇~5 ° C followed by stirring crystallization, filtration, and dried to give a white solid 〇.54g. Pivalate methyl iodide using the method of low-temperature reaction, post-treatment operation complicated, solvent volume, increasing both cost and environmental pollution, and methyl iodide pivalate unstable, expensive, not suitable for industrial production. Alternatively the Bipei Nan 18g, N, N- dimethylformamide 162mL, potassium 6. 54g, tetrabutylammonium bromide (λ45g, the reaction 60min, was added dropwise at this temperature at 25 ° C for chloromethyl pivalate 8. 93g, after the completion of the reaction, water was added and stirred for 10 minutes, 320ml, 160ml ethyl acetate was added to extract the aqueous phase extracted with ethyl acetate and once with 160ml ethyl acetate were combined, washed with water, phase separation, ethyl acetate washed with water 640ml paint ester, the ethyl acetate phase over anhydrous sodium sulfate was added 60g, decolorizing charcoal and dried, and the filtrate was concentrated, was added dropwise 25 ° C under stirring for crystallization 162mL isopropyl ether, filtered and dried to give a white solid 17. 64g. purity by HPLC 99.87%, the yield was 89.7%. Chem. Pharm. Bull. 2006, 54, 1408-1411. J. Antibiot. 2006, 59, 241-247. Abe, T.; Hayashi, K.; Mihira, A.; Satoh, C.; Tamai, S.; Yamamoto, S.; Hikida, M.; Kumagai, T.; Kitamura, M.
Halogenation of allylamine (I) with either bromine or sulfuryl chloride produced the corresponding (halomethyl)aziridines (II). Subsequent treatment of (II) with n-butyllithium at -78 C yielded 1-azabicyclobutane (III). Opening of the bicyclic system of (III) with formic acid followed by acid hydrolysis provided 3-hydroxyazetidine (IV). This was condensed with 2-(methylsulfanyl)thiazoline (V) to give thiazolinylazetidine (VI). Alternatively, 3-hydroxyazetidine (IV) was condensed with 2-chloroethyl isothiocyanate (VII) to give the intermediate thiourea (VIII), which cyclized to the thiazoline (VI). Conversion of the hydroxyl group of (VI) into the thioacetate (IX) was carried out by either coupling with thioacetic acid under Mitsunobu conditions or by conversion to mesylate (X) followed by displacement with potassium thioacetate. The required thiol (XI) was then obtained from (IX) by basic hydrolysis of the thioacetate ester. 1-azabicyclobutane (III) was opened with thioacetic acid with concomitant N-acetylation yielding (XII). Further acid hydrolysis of (XII) gave 3-mercaptoazetidine (XIII). Condensation of (XIII) with either 2-(methylthio)thiazoline (V) or 2-chloroethyl isothiocyanate (VII) then produced thiazolinylazetidine (XI). A further procedure consisted in the opening of 1-azabicyclobutane (III) with 2-mercaptothiazoline (XIV) to give (XV). Subsequent rearrangement of (XV) in the presence of methanesulfonic acid produced thiazolinyl azetidine (XI). Condensation of (phosphoryloxy)carbapenem (XVI) with 3-mercapto-1-(1,3-thiazolin-2-yl)azetidine (XI) gave thioether (XVII). The p-nitrobenzyl ester group of (XVII) was then deprotected with Zn powder to afford the target carboxylic acid. Jump up^ El-Gamal, M. I.; Oh, C. H. (2010). “Current status of carbapenem antibiotics”. Current Topics in Medicinal Chemistry. 10 (18): 1882–1897. doi:10.2174/156802610793176639. PMID 20615191. Jump up^ Fujimoto, K.; Takemoto, K.; Hatano, K.; Nakai, T.; Terashita, S.; Matsumoto, M.; Eriguchi, Y.; Eguchi, K.; Shimizudani, T.; Sato, K.; Kanazawa, K.; Sunagawa, M.; Ueda, Y. (2012). “Novel Carbapenem Antibiotics for Parenteral and Oral Applications: In Vitro and in Vivo Activities of 2-Aryl Carbapenems and Their Pharmacokinetics in Laboratory Animals”. Antimicrobial Agents and Chemotherapy. 57 (2): 697–707. doi:10.1128/AAC.01051-12. PMC 3553697  . PMID 23147735. Jump up^ Kato, K.; Shirasaka, Y.; Kuraoka, E.; Kikuchi, A.; Iguchi, M.; Suzuki, H.; Shibasaki, S.; Kurosawa, T.; Tamai, I. (2010). “Intestinal Absorption Mechanism of Tebipenem Pivoxil, a Novel Oral Carbapenem: Involvement of Human OATP Family in Apical Membrane Transport”. Molecular Pharmaceutics. 7 (5): 1747–1756. doi:10.1021/mp100130b. PMID 20735088. Jump up^ Sugita, R. (2013). “Good transfer of tebipenem into middle ear effusion conduces to the favorable clinical outcomes of tebipenem pivoxil in pediatric patients with acute otitis media”. Journal of Infection and Chemotherapy. 19 (3): 465–471. doi:10.1007/s10156-012-0513-5. PMID 23393013. Jump up^ Rossi, S, ed. (7 August 2014). “Tebipenem Pivoxil”. Martindale: The Complete Drug Reference. London, UK: Pharmaceutical Press. Retrieved 6 April 2015. Jump up^ Hazra, S; Xu, H; Blanchard, J (June 2014). “Tebipenem, a New Carbapenem Antibiotic is a Slow Substrate that Inhibits the β-Lactamase from Mycobacterium tuberculosis” (PDF). Biochemistry. 53 (22): 3671–3678. doi:10.1021/bi500339j. PMC 4053071  . PMID 24846409.